Located at the embassy belt in Tanglin, between the Singapore Botanic Gardens and Orchard Road, Asia’s most trendy street and tourist attraction, Beaufort On Nassim is an invaluable investment that you should not miss. 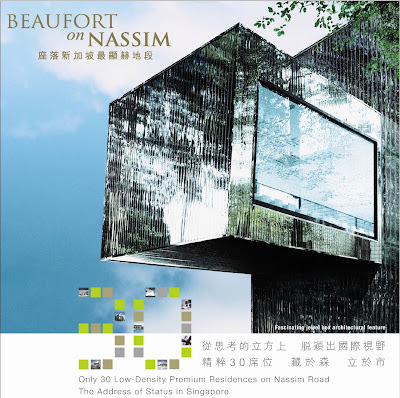 Beaufort On Nassim heralds a new generation of beautiful and quality homes catering for modern and luxurious living. The 30-unit development, with sizes ranging from 1,238 sq ft to 3,692 sq ft including 8 penthouses with private swimming pool/jacuzzi, consists of a variety of deluxe and contemporary designs and layouts to meet different lifestyles and tastes. All apartments are fully equipped with award-winning designer brands including Bulthaup kitchen cabinets, Gaggenau appliances, Villeroy and Boch and Hansgrohe sanitary wares and fittings. The development is conceived and developed by HKR International Ltd (listed in Hong Kong since 1987), a leading property developer and hotel operator with diversified interests in Hong Kong, China and South East Asia. You are currently browsing the archives for the Beaufort on Nassim category.